Mr. German Wankmiller, Chairman of the Management Board and CEO at GROB-WERKE, speaking to us at the AMB in Stuttgart. He talks about how the trade fair in Stuttgart is going, the current situation in the mechanical engineering sector and developments at the GROB plants. How pleased are you with the way the trade fair is going? German Wankmiller: The AMB in Stuttgart always attracts a large number of visitors. After the EMO, it's the best trade fair in Germany. We are seeing a large number of visitors to the GROB stand, its very gratifying. There are also numerous very specific project inquiries that could turn into highly promising orders. Which new trade fair concepts or technical innovations at the AMB impressed you the most? I didn't come across any completely new innovations that we haven't seen before. That said, many machine manufacturers seem to be following a trend towards an automated solution for loading and unloading, either as an in-house development or a purchase from elsewhere. The trend towards automating machines, then, is clearly emerging. The two key topics at this year's AMB are digitalization and automation. How are these topics being implemented at GROB and what can you offer your customers? GROB continues to develop GROB-NET4Industry, its proprietary industrial software. We are demonstrating advanced apps at the trade fair. GROB is also showcasing the app for networking machines at this trade fair. At one large display, visitors can follow the networking of all machines in the Mindelheim plant. So they see in practical terms how we envisage networking production using GROB-NET4Industry. Alongside our existing GROB4Pilot control panel with Siemen control, we are also debuting at this trade fair the new control panel (HMI) with Heidenhain control. The Heidenhain control system is important, especially in the die and mold industries and other universal machining center sectors. We can generally show a significant further development of our GROB-NET4Industry software on our stand. GROB's aim has always been to create an open platform with its software. Its conceptual design allows us to communicate with various control systems via the connector. In the automation sector, we are demonstrating our rotary pallet storage system that we showcased at an exhibition three years ago for the first time. The GROB automation system has undergone extremely rapid development since then and we are pleased to have sold numerous machines featuring this rotary storage system. How do you think the mechanical engineering sector will develop in the future? We are seeing different developments in the mechanical engineering sector. A number of competitors are focusing on finding additional and new part applications with their machine tools – for new markets and for new customers. A few other companies, such as GROB, are facing the challenge of electromobility head on and developing completely new machine concepts for products in this sector. In this sense, the entire mechanical engineering sector is changing at a rapid pace, but the process is taking very different forms. We have decided to square up to the challenge of electromobility and break new ground. Challenges and tasks that will take years and have a key impact on our product range. 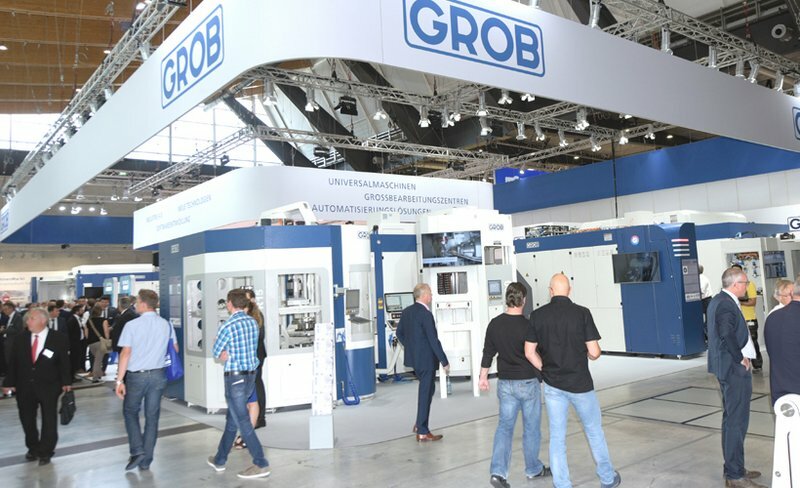 How is the current order situation developing for GROB this 2018/2019 fiscal year in the system business, universal machining center business and automation/assembly sectors? Electromobility has brought about new development and investment cycles for our customers. In the machine and production line system business for the combustion engine, the order level is currently declining. The automotive industry is now investing heavily in new systems for electromobility. Despite this development, however, we are very pleased with the order book in the system business division. The universal machining center business is going extremely well, as we have developed new machines with automation systems. In the 2018/19 fiscal year, we effectively increased incoming orders and revenue with universal machining centers by 18 percent. In the automation and assembly sectors, GROB is among the strongest suppliers in Europe and we have been able to expand this segment quite considerably. We can present a broad range of assembly technology and have significantly increased our revenue as a result. This technology includes assembly systems for conventional engines and gearboxes, as well as systems for assembling electric drives and battery systems. When GROB established an additional product sector by entering electromobility three years ago, it was one of the first companies in the industry to address this issue in detail. Have your expectations since then been met and how do you see the electric drive developing in the future? Three years ago, we decided that the development of machines and systems for the electromobility sector would be an additional strategic pillar. We can see today that this was a good move. Despite the technological changes in the automotive industry, GROB as a company is now capable of delivering machines and systems for any drive concept. With which companies in the automotive industry do you already have relationships for "electromobility"? The vehicle manufacturers are very polarized in terms of the extent to which electric drives will be used in their future vehicles. Some manufacturers see the volumes of electric and hybrid vehicles as extremely positive and are therefore investing very heavily in machines for producing electric drives and battery systems in-house. Other companies are less eager to tackle this development and are investing in smaller machines with the option to expand. There is, however, a general feeling that electromobility is set to become a key aspect of Europe's automotive industry. In the Asian market, particularly in China, there is a real push towards developing expertise and machines for electromobility. In all markets, however, GROB is up and running with the new technology involved in production machines for electromobility. Moreover, GROB is in constant contact with universities and institutes for research and development in the new technologies. The future of the combustion engine is discussed again and again. In your opinion, will the combustion engine still be around in 10, 20 or 30 years? Combustion engines, no matter whether petrol or diesel, still hold great potential for improving and reducing harmful emissions. So there will be further developments in the next generations of combustion engines and gearboxes. How do you see the current trend towards introducing driving restrictions for diesel vehicles from Category 5 in the bigger German cities, and how will these restrictions impact the mechanical engineering sector? Generally speaking, people's awareness of environmental conditions will continue to increase. The driving restriction in the cities will prompt the Federal Government to act and the automotive industry will have to develop concepts and technical solutions for reducing fine dusts and nitrogen oxides. All this is technically possible. The diesel engine, for example, still offers huge benefits due to its low CO2 emissions. It is my belief that diesel vehicles will be even cleaner in future and hence remain part of vehicle fleets. GROB has enjoyed steady growth in the ten years since the financial crisis. Will the company's realignment towards electromobility alter this extremely positive development? In the last years, GROB has undergone enormous change, not only in terms of revenue but also in the development of numerous new machines, technologies and processes, and this coupled with an increase in the workforce and worldwide growth in the subsidiaries and plants. We do not intend to continue growing at such a pace. Our goal is to be able to respond to changes in vehicle manufacture as best we can. We have already achieved this and are prepared for the future. In addition to producing machine tools, we are a leading manufacturer of assembly technology and, of late, also of systems for electromobility. We will continue to enhance this expertise and market position. By and large, I am expecting that in the system business – as already mentioned – we will continue to experience change and that both electromobility and assembly technology will account for an increasingly large proportion of our revenue. All this brings us to the conclusion that we have made the right decisions and positioned the company well for the long-term. That said, I can answer the question about the prognosis for future growth in a positive way. Our primary goal was and still is to embark on the right technologies and developments early enough to successfully accompany future developments on the market and safeguard jobs for the long term. The company's size is only one factor. It is much more important that we are able to continually observe and guarantee technological processes and key criteria, such as quality and delivery reliability.